Visit the Fifth Fleet Dedication Ceremony page. 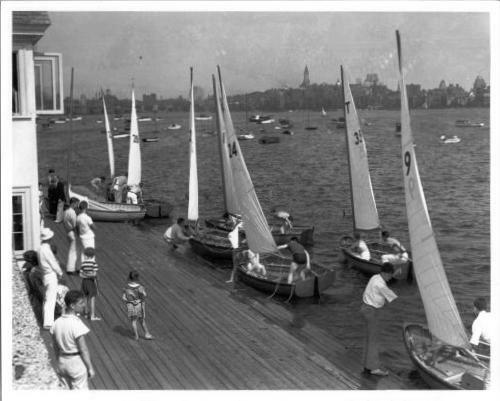 The MIT Sailing Pavilion, the first facility constructed for college sailing, was built in 1935. It is now known as the birthplace of today's collegiate sailing. A number of colleges had sailing clubs in the late 1800s; however, these were primarily social clubs consisting of private boat owners. 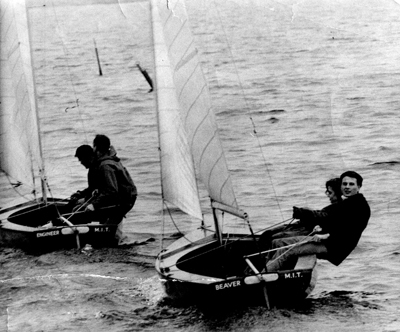 The first ten Dinghy Championships of the newly organized Intercollegiate Yacht Racing Association (ICYRA) were sailed on the Charles River in MIT's fleet of cat-rigged, wooden Tech Dinghies. To this day, MIT continues to host more college regattas than any other site in the country. In the fall of 1994 it hosted the ICYRA's first annual Women's Singlehanded Championship in Laser Radials. MIT provides practice time for local colleges and high schools who do not have boats and sites of their own. Currently, the sailing teams from the following colleges and universities practice and race from the MIT Pavilion: Brandeis, Northeastern, and Wellesley College. Wooden Tech Dinghies "Beaver" and "Engineer" of the 1950's. MIT has over 100 sailboats in its fleet. The Tech Dinghies (designed by the MIT Naval Architecture Department) continue to be the most-used boats. MIT is now on its sixth fleet of Techs. It also has Lasers, FJs, Lynx Catboats, 420s, Fireflies, sailboards, and a Moth. MIT owns and maintains a 43 foot C&C for ocean trips. Built in 1935 and later named after one of its founders, Jack Wood, the MIT Sailing Pavilion continues to hold more collegiate regattas than any other site in the US. In addition to intercollegiate activity, the Pavilion is busy with a regular schedule of club racing, teaching, and recreational sailing. Donations from alumni and other supporters are essential to finance the club's programs, and are greatly appreciated. During the season (from April to mid-November), the club runs beginning sailing classes on Wednesday afternoons. During the summer additional beginning classes are offered on Sunday mornings. In the spring and fall, the coaches run Physical Education sailing classes. During the summer the club administers three racing programs: beginners' racing classes on Monday nights, advanced tech racing on Tuesdays, and intermediate/advanced racing on Thursdays. During the Fall and Spring Intercollegiate seasons, the club holds advanced tech racing on Monday evenings. Summer evening club racing in Techs typically gets all of the boats out on the river. In the summer, the club also teaches sailing to young children in MIT's day camp. As a service to the local sailing community, MIT runs championships for Massachusetts and New England secondary schools and Massachusetts Bay Yacht Clubs that include ladder events for US sailing. MIT has run the Massachusetts Bay Midget Championship for youngsters 13 and under every year since its inception in 1951. MIT sailors have played important roles in major competition and in the administration of sailing. Four former MIT students have represented the USA in Olympic sailing competition, winning a silver and a bronze medal. Paula Lewin '93, consistently ranked at the top of the Women's Professional Match Racing Circuit and represented Bermuda in both the 1992 and 1996 Olympics. Bob Hobbs, a former MIT undergraduate and graduate student, was president of US Sailing and earlier served as head of the ICYRA. To this day, the professionals of the MIT program are leading administrators of New England and national college sailing. Twelve MIT sailors are in College Sailing's Hall of Fame; five have been All-Americans, four Honorable Mentions, two All-Star crews, and two Women All-Americans. MIT is one of the most academically selective institutions in the country and gives no special consideration to admitting talented sailors (or any other athletes); however, its program has allowed dedicated individuals to advance their sailing performance dramatically. The MIT Sailing Pavilion is a busy, active, friendly, and low-key place for campus gatherings. We regularly have cookouts, trips to the Boston Harbor Islands, and moonlight sails. We also act as a base for research and testing of equipment for MIT's Sea Grant Program.